There are Gordon Ramsay fans and there are others. Usually other’s dislike of him is because of his heavy use of four letter words. Understand… well, now there is a way around that issue. Gordon Ramsay has long had an iPhone app that was a nice little recipe book. With the iPad, he has used more of the available screen space to bring you more information. The 56 included recipes have more than an ending picture of what the ‘pros’ can create. Instead, you are provided with step by step instructions with images of that step. Not enough? Gordon has also included video of him doing the steps… right there in the kitchen. 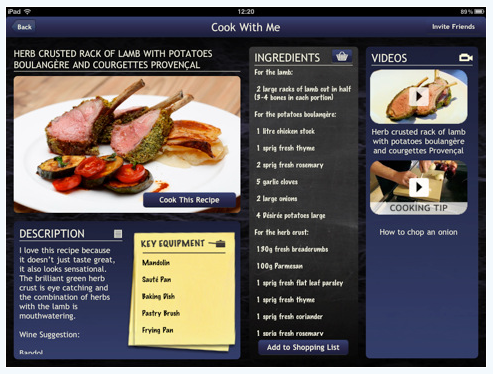 Gordon Ramsay Cook With Me on the iPad goes to the grocery store too. You can divide your shopping lists down by area of the store so your not hunting through the list for canned peas in the fresh produce area. Swipe out what you find is a fun graphic like we used to have on our paper lists mom used. Just in case he does something ‘we should all know’, there is also 10 videos included of Gordon doing the basic skills we all need in the kitchen. If your above the basic, take a look at them anyways, he’s really good at making things look so simple! And not a swear word in the whole thing.